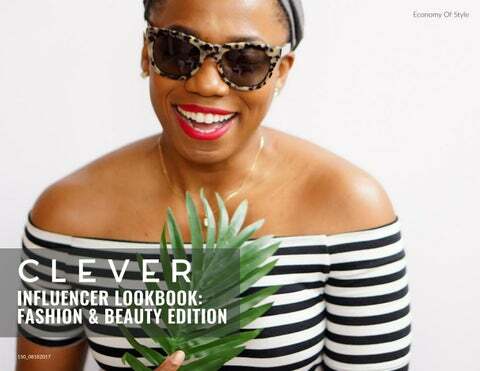 AUTHENTICITY IS ALWAYS IN STYLE CLEVERâ&#x20AC;&#x2122;s brand-safe fashion & beauty influencers create results-driven #sponsored content that resonates with all interests and audiences. Everywhere. Every time. REAL STYLE. REAL PEOPLE. REAL RESULTS. Our influencers offer everything from relatable style-driven content to fresh takes on the hottest trends in fashion and beauty. All-Embracing. Ever-Evolving. Always Authentic. EVERY TIER EVERY AUDIENCE EVERY SIZE Blending approachability, trust, and talent, our complete ecosystem of vetted fashion and beauty storytellers take influencer marketing programs to the next level. GUARANTEED. SOCIAL MEDIA CELEBRITIES CLEVERâ&#x20AC;&#x2122;s social media celebrities ignite major brand awareness and share eye-catching content with dedicated and eager style-focused communities. TRUSTED & TRENDY Relatable, compelling, and charming, CLEVER microinfluencers keep it real and garner major results. Our talented roster of microinfluencers produce and share captivating user-generated content, engage with their dedicated audiences, fuel brand interest, affinity, and purchase intent. 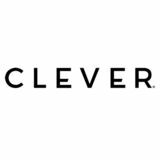 FASHION FANATICS & BEAUTY BUFFS CLEVER’s influencer ecosystem includes social media’s most authentic and effective brand-to-consumer connections: FRIEND-TO-FRIEND. As trustworthy as your go-to Little Black Dress, our friend-to-friend influencers boast out-of-this world engagement, far beyond that of social media celebrities, and guarantee off-the-chart impressions. BEYOND THE BIB: ON-TREND TINY TOTS CLEVER’s youngest influencers may be tiny in size, but their stylish brand voices are loud—and consumers (Hi, Mom and Dad!) are listening! Masters of their A-B-Cs, 1-2-3s, and the cutest catered-to-kids looks, our On-Trend Tiny Tots create ‘Aww!’-inducing sponsored content guaranteed to make your brand go BOOM! BRAND CONTENT THAT FITS LIKE A GLOVE Timeless and trend-resistant, our influencer-created brand content is evergreen. Repurpose. Reinvent. Reshare. This story is yours. FASHION & BEAUTY ACTIVATIONS OUR FASHION & BEAUTY INFLUENCERS CAN... CREATE VIDEOS • SHARE VIDEOS • WRITE BLOG POSTS SAMPLE PRODUCTS • SNAP PHOTOS • ENTER CONTESTS HOST HOUSE PARTIES • AMPLIFY BRAND CONTENT PARTICIPATE IN VIRTUAL FOCUS GROUPS AND MUCH, MUCH, MORE! CLEVER INFLUENCERS MAKE A STATEMENT We’re bursting at the seams with head-turning influencer marketing ideas for your brand! Let’s make a (beauty) mark on your industry. Sit front row for our beauty & fashion influencers' trendsetting & head-turning content.